”The Walking Dead” Season 6 finale came down to the (barbed) wire. Then, just when Negan (Jeffrey Dean Morgan) was about to kill someone with his signature baseball bat, we switched to the victim’s point-of-view and had no idea who he or she was. 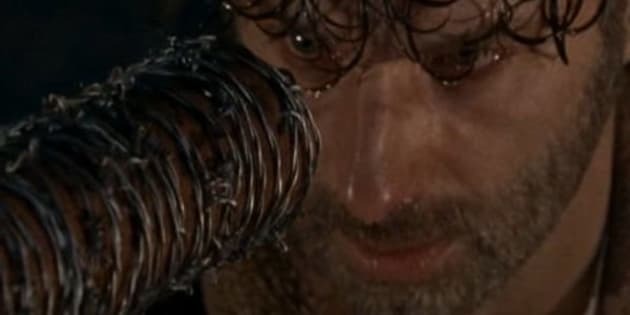 Some say the Negan baseball bat cliffhanger was a swing and miss; however, “Walking Dead” showrunner Scott Gimple and creator Robert Kirkman have said it’s worth the wait. Now, we may know why. Negan probably has more than one victim. Based on the show’s “filming schedule” and “other evidence that has popped up over the last couple of months,” “The Spoiling Dead Fans,” a fan group known for having the jump on leaks, predicts that Negan is taking out two of the cast. Specifically, they’re predicting Abraham (Michael Cudlitz) and Glenn (Steven Yeun) will be the ones to go. Now, after the show’s Comic-Con trip, there’s even more evidence. First, it looks like we can eliminate a few names from the list of potential victims (which currently sits at 11). It’s already reported that Rick and Carl are likely safe, but a few shots from the Season 7 trailer might eliminate even more. Maggie would obviously be a huge reveal since she’s also highly speculated to be a victim. But even if we can eliminate her from the list, why are Abraham and Glenn the ones to go? OK, so there’s already a ton of evidence why Glenn would get the bat. He’s had too many close calls, there’s all this foreshadowing (like when he found the pictures of people with their heads seemingly bashed in), and, above all, it’s what happens in the comic. But what about Abe? Well, he dies around this point in the comic, too. In that version of “Walking Dead,” he takes the crossbow to the head instead of Denise. Now it looks like the show might’ve just been saving him for a bigger death. The “Walking Dead” panel appearance only offered support. After Yeun told a story about how everything for his character, Glenn, was going too well right before his comic book death, Cudlitz explained how everything for Abraham is also going really well right now on the show. Now that I think Abraham sees a tomorrow, and a tomorrow after tomorrow, he can’t deny what his heart is feeling. So it’s not convenience anymore. It’s actual practicality. And he finds a lot of things that he just admires in Sasha to be those things that he has always held important in his life that she already possesses: a will to survive, strength, intelligence, beauty. And he wants to share that with her. And as hard as it is ― because I think he still loves Rosita, would do anything for Rosita and for Eugene because they are his family ― there comes a point where you can’t deny what you’re feeling. And this is a time in the story where he’s allowed to feel. And he’s reminded that there are things that are worth not only dying for but living for. Wow. In other words, R.I.P., Abes. Maybes. “The Walking Dead” returns Sunday, Oct. 23, at 9 p.m.